While O’Neill is away (more below), the rest of the team has to contend with a problem at home. 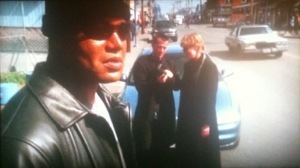 A vanished scientist points SG-1 to a small town where everything seems normal, until it gets dark. What’s weirder is they don’t remember what it is they’ve done the morning after. The answer to this? They have been infected by cloned Goa’uld symbiotes that only can operate at night, and their plan has to be stopped! –So, we get another callback to the Adrian Conrad stuff from last season, as the symbiotes affecting the town were clones of the symbiote involved in that. 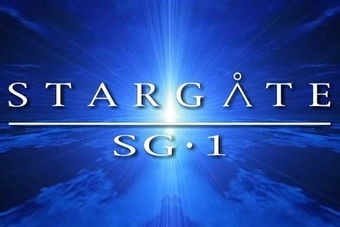 –This is one of the rare episodes of SG-1 that has no characters from the original movie in it. –So surprise, the NID have been monitoring the whole thing, giving us some plot exposition and planning to take the spaceship the possessed townsfolk are making, and–oh, and they get captured. –Good that Carter’s gambit drinking that symbiote killing enzyme worked, because she saves her teammates and shuts down the whole evil operation. Thanks to the symbiote that was used to heal him, O’Neill is pulled into a failed rescue and is captured by the System Lord, Ba’al. To break his captive, Ba’al tortures O’Neill to death, and revives him with a sarcophagus, again and again. As the team plans to save their leader, O’Neill receives support from an unexpected but welcome ally: the Ascended Daniel Jackson! But will encouragement be enough to save O’Neill from this ongoing torment? –So Kanan, the symbiote that lead O’Neill to rescue that slave of Ba’al (because of love), left O’Neill before Ba’al captured him. And since we never see Kanan again, that puts a ribbon on that. –There’s some inventive stuff in this episode, like Ba’al’s gravity crazy prison. 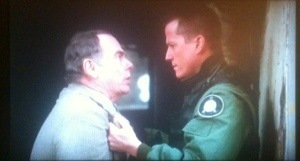 And then there’s how it’s used to inflict pain on O’Neill. –Daniel offers to help O’Neill to maybe Ascend, but cannot interfere or help him escape because of Ascended rules. Let’s see how that holds up for Daniel by the end of the season. 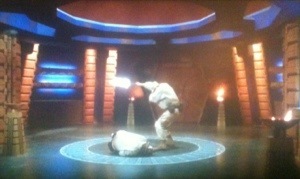 –SG-1 has to make an alliance with System Lord Yu to breach Ba’al’s facility and save O’Neill. The enemy of my enemy is my friend? Jonas’ homeworld asks the SGC for help in securing technology from Earth to defend themselves from a likely inevitable war. Even after the dicey last encounter with the Kelownans, the SGC is still interested in the refined Naquadria they possess. But it’s Jonas’ mentor, Dr. Kiernan, who has a riskier proposition: using a resistance movement he’s a part of to stage a coup on his own government to stop any further hostilities. As we start seeing in this episode, the doctor himself has a secret that may put into question his plans. –Always a welcome sight to see veteran actor Dean Stockwell on screen, as he is here as the schizophrenic Kiernan. –Oh yeah, Kiernan is suffering from schizophrenia as a result of unsafe exposure to Naquadria. Admittedly in the episode commentary, this was meant to be a riff on the John Nash story, seen in the Oscar-winning A Beautiful Mind. –It’s an uncertain place we’re left in by episode’s end, as the asylum-bound Kieran warns Jonas of an inevitable coup attempt and usage of a Naquadria bomb on their home world. We’ll come back to that threat before long. –So the SGC is willing to trade non-military technology, but not any weaponry. A little more lax in trade than the Tollans, but look what happened to them. During a routine expedition, SG-1 is captured by the Goa’uld, much to the surprise of their support team. Instead of heading home, the non-combat ready scientist team tries to mount a rescue of the team. But unbeknownst to them, SG-1 meant to be captured, so they could contact a deep cover Tok’ra spy in the Goa’uld. 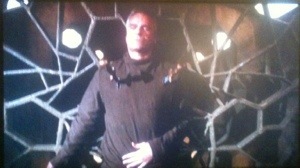 When things go bad for SG-1 (for reals), the scientists really do have to save O’Neill and company. When in doubt, just for indiscriminately and maybe you’ll hit something. –Just realizing one of the scientists in this episode is the actor who plays Dr. Phlox on Star Trek: Enterprise. –So the Tok’ra agent capturing them is the same Lord, Khonsu, who abducted them in this ruse to pass along intel. But leave it to one of more loyal Jaffa to Anubis to snuff him out when realizing the ruse. –Carter kissing that one scientist at that awards ceremony? C’mon, we all knew that was a dream. NEXT TIME: Bad blood between Jaffa rebels and Tok’ra at an SGC outpost boil over thanks to a mystery assassin in “Allegiance”, a planet has a super drug that may be connected to the Goa’uld symbiotes in “Cure”, a experimental spaceship hijacking puts O’Neill and Jonas on a mission to recover it in “Prometheus”, and the team helps the Asgardians in a risky operation to destroy the Collectors in “Unnatural Selection”.